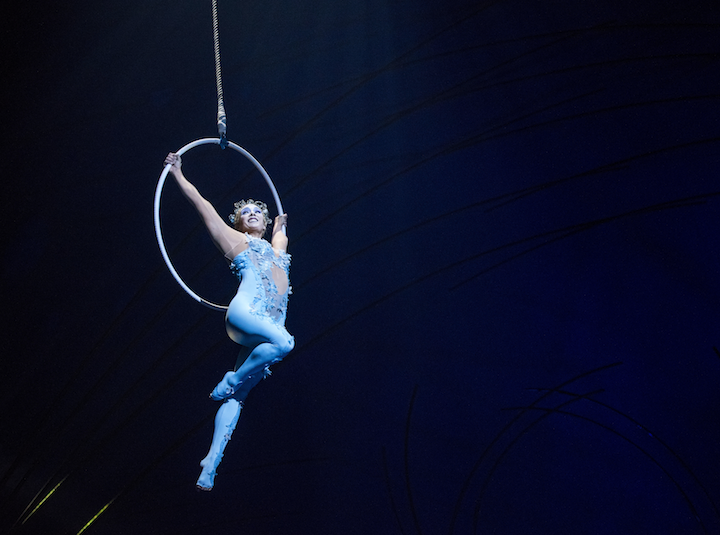 Amaluna is the newest Cirque du Soleil extravaganza now showing under the big top at Atlantic Station. For the first time in Cirque du Soleil history, the cast is more than 70% female with 46 artists representing 17 nationalities. The Cirque development team wanted to create a brand new show making a conscious effort to showcase the strength and beauty of woman. The band is also 100% female, another first in Cirque history. You go girl(s)! The “Amazon” warriors (featured above) are the first uneven bars act in Cirque history. The performers are all former NCAA gymnasts recruited just for this show. They even designed their routine during a workshop which started before rehearsals began. A few more fun facts: this is the first time the water bowl act has been performed on tour (although it’s used in Cirque’s Vegas shows). In the interest of sustainability, the tank is only filled once per city then filtered like a hot tub. There are 114 people in this traveling circus with 50 trucks weighing more than 2,000 tons. There are 1,000 costume pieces used, and all the performers are trained in how to apply their own makeup. 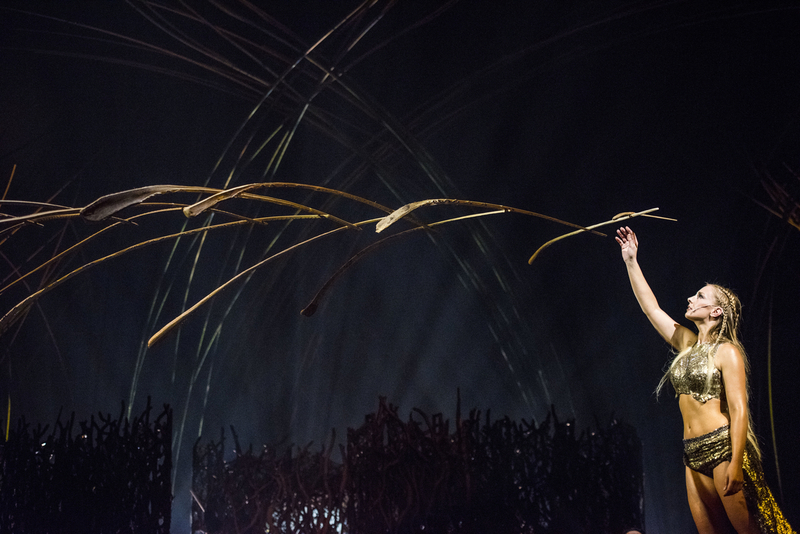 This balancing palm branches act is another first for Cirque. The performer “the Balance Goddess” creates a mobile made of 13 palm branches which she literally balances in the palm of her hand. 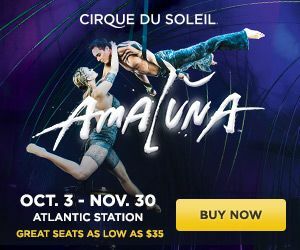 Amaluna is playing now through Nov. 30 at Atlantic Station. Click here for a list of showtimes and to purchase tickets. Pretty Southern is giving two of our lucky readers a pair of tickets (each) for next Tuesday, Oct. 28, at 7 p.m. Comment below and share this post for a chance to win! The two winners for the two pairs of tickets will be notified via email. Editor’s note – photos by Pouya Dianat/Allied Integrated Marketing. I think it’s so wonderful that they’re using a mostly female cast! I’ve heard great things about the show and would love to go see it! I love the Cirque shows at Atlantic Station! I’ve never seen a show with water involved, how cool 🙂 Great giveaway – would love to see the show next week! I had no idea that this was going on at Atlantic Station! I went to a show they had about 2 years ago at Atlantic Station and it was phenomenal – I think it was the Totem show. This one looks great too and I would love to be able to go! I’m so excited about such a female focused show. I really like how strength is such a focal point in the meaning behind the performance. Although I think beauty is inherent in all women, I’m glad it’s focus isn’t solely based on how delicate we are. That is a direct representation of how I view us Southern women to be: beautiful and delicate looking, but strong and empowering, as well! Love Cirque de Soleil and would love a chance to go to the show next week!! Love the all female cast! We’d love to go! I have NEVER been to a Cirque show and this would be AMAZING. The review looks great and was so well-written that it has me so excited and I am crossing all of my fingers and toes for this one! Love your blog and would LOVEEE to win this! Thank you so much for this opportunity!! I heard about this and I really wanted to see it! It looks like it was such a great show! The pictures are beautiful too!